CAPE CANAVERAL, Florida â€” NASA will try next week to launch space shuttle Discovery on its final voyage following a four-month delay for fuel tank repairs. Liftoff is set for late Thursday afternoon. Senior managers voted unanimously Friday on the new launch date after discussing the fixes made since the shuttle's grounding in early November. Cracks in the external fuel tank were discovered after a launch attempt was foiled by leaking hydrogen gas. It's taken this long to understand and repair the cracking, which could have harmed the shuttle during liftoff. All will be well. Scrubs are all I can see. Other than that they will be OK. I'm thinking the ff, if it happens, might not be directly related to the shuttle at all, though it could be. Might just be timed, ritual. I'm more worried about that "mushroom cloud"-looking thing down here on earth. Have you ever seen a Shuttle launch? Look at 00.09 secs when they ignite the booster to 00.05 and after. 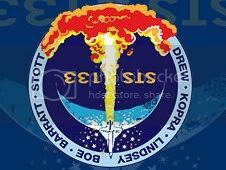 Same as what they put on the STS-133 mission patch only not upside down. Soon they will revert to the old antiquated Soyuz. Shame on the US government for nicking the Space Shuttles. Yeah, I know that. I used to work in Aerospace. I had a coffee cup with a launching shuttle rocket, but here the flames are not coming out of the rocket but the shuttle itlself. So, not realistic. The question then is why did they represent it this way? So... what is your take then? A nuke in the main external tank? Another Columbia disaster? I think this mission and the next coming ones will be a success. My only regret is that the U.S. are broke and rather than putting an end to war in Af/Pak and Iraq the U.S. government has decided to nick the Space Shuttles. Shameful U.S.! Like I said, I don't necessarily believe the shuttle will be directly involved. But right now, the world is poised on a knife's edge re. Israel/Iran. A false-flag might help draw in the U.S for sure. Naval exercises going on this week. Three reasons to be wary this week. I wonder what they replaced the shuttle with and are not telling us. "Those that know the least obey the best"